There are Some Great Coffee Shops in Kingston, Ontario! If you are wandering around downtown Kingston, there are a few great places for you to grab a hot drink – whether it’s a coffee, tea, hot chocolate, or otherwise. It’s no secret that Eric lived in Kingston for many years (and LOVES Kingston). That said, the coffee scene has changed quite a bit in recent years! Back in the day, coffee downtown was just a handful of places and a few classics like Tim Hortons and Starbucks. More recently, the coffee scene downtown has developed with a few more great places for you to check out. Also, there are obviously a few more coffee shops that we left out. Don’t worry, we will add to this post as we check them out! So, below are a few of our favourite coffee shops in Kingston. You’ll note that we don’t include any of the massive brands (like Tim Hortons or Starbucks) but you can find them on Princess Street if you are in a pinch. For this article, we wanted to highlight a few more local places to grab that perfect Kingston coffee! In the summer, the windows are open for the breeze to roll through! Located right across from Springer Market Square (the public square behind City Hall), Kingston Coffee House was a place that Eric always walked by but never ventured into. Well, that has changed! 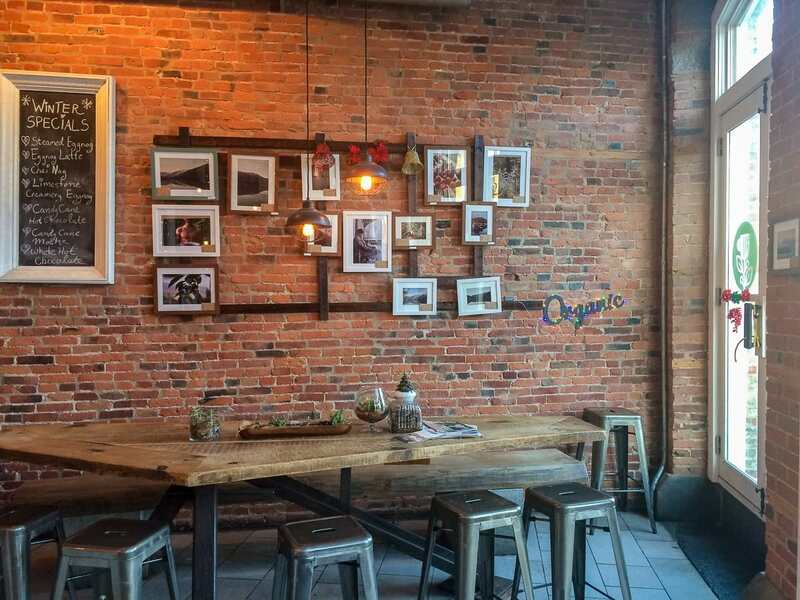 Inside, you get these great vibes of red brick and cozy tables. Kingston Coffee House is super cozy inside. The staff were super nice and the beverage menu is pretty big – including more artisan coffee blends if you are into that. Lisa got a hot chocolate which was quite sweet but she loved it. Lacking caffeine, Eric just got a standard Americano which was pretty good! It was nice to just sit for a second since we had been running around doing errands downtown. Lisa’s hot chocolate in front and Eric’s Americano in the back. In the summer time, you will see students studying there at the front tables by the window. They open the wooden window panels to allow for the air to flow in. That makes it a great spot to check out in the summer if you want to be around all the downtown Kingston action. We would recommend! You might have heard of Balzac’s before – and that would not be a bad thing. Balzac’s is basically the only “chain” places that we included on this list – but they do a good job of serving up coffee. Balzac’s Kingston is right on Princess Street (just head for Princess Street and you will find all of them, honestly) right at the corner with Sydenham Street. Inside, you’ll find a large coffee bar with limited seating. The decor is standard across the brand but it honestly looks really nice. Very trendy, kind of classy in a way. Balzac’s has your standard cafe drinks (both hot and cold) as well as a few glass covered sweets to choose from. There is even a little shelf to buy coffee or tea in-house to take home. Sipps is right across from Springer Market Square! Located right downtown, Sipps is a classic go-to location for students and visitors alike. Some consider Sipps a “must-do-stop” if you are in the city since it’s great to support awesome local businesses. We wandered in from the cold and had a takeaway hot chocolate and regular filter coffee. Both were excellent. Inside, there is loads of seating since the place is really deep in the back. That said, the tables were all taken by students who were posted up for long study sessions. So, you MIGHT have to take your coffee to-go. In the summer time, they extend the seating onto the sidewalk so you might get the chance to sit outside. Kingston summer evenings are amazing for sitting outside and enjoying a drink – and a hot beverage is no exception. Sipps also has a few sweets on hand if you want a sweeter snack like a cookie, piece of cake, or brownie. Don’t expect to eat a full lunch here – we mean, it IS a dessert bar, after all! Located right on Princess Street about half way down towards the water, CRAVE opened not too many years ago and has left its mark on Kingston coffee culture. The place is massive – making it a hub for students to study in. Don’t be scared of them, though – they just need a hot drink, a plug, and some WiFi and they will generally leave you alone! CRAVE has loads of sweet treats on site (they are a bakery, after all) and a fridge in the front with fresh items like salads and sandwiches, etc. Eric visited a few years ago to meet with friends and sat in a comfy booth which was nice. CRAVE also has an outdoor patio in the front in the summer months which can get busy since the location is prime. Overall, CRAVE has something for everyone – eating in or taking away! One of the newest additions to the coffee/brunch scene in Kingston, NORTHSIDE is apparently THE place to go. Opened by some Australians who came to Kingston, the place has definitely made a name for itself in a short period of time. Now, just to be clear – we have not yet been to Northside. We have it on the list because we were about to go there for brunch. It was HIGHLY recommended by a friend of Eric’s who still lives in Kingston. However, when we checked online, they were closed during the time we were in town. It was the holidays, so we get it! Honestly, it was a little disappointing after all the build up – but it means that we will have to come back to Kingston really soon and try it out! If you look at their photos on Facebook, the food looks super well done and the coffees look very artsy. Apparently, everything tastes as good as it looks (says our local friend). So, if you are in Kingston, head down Princess Street to Northside and let us know what you think! And last, but certainly not least – we have Common Ground Coffeehouse. Located in the Queen’s Centre (sometimes called the ARC) on Queen’s University Campus, Common Ground (or CoGro, for short) is actually a really good student run coffee shop. Common Ground does great coffees and a variety of hot drinks – but they also do really good food. You can get a wrap, sandwich, or a specialty bagel made onsite and they are always really fresh. CoGro is located on the second floor of the Queen’s Centre so take the stairs or use the elevator and you will not miss it. It has a massive seating area which will likely be FULL of students studying at tables or on comfy couches – so if you are just passing through grab your coffee to go and wander around campus! And there you have it – 6 of the best coffee shops in Kingston, Ontario. As we said up top, we missed a few but we haven’t been to all of the coffee shops in Kingston yet. We love Kingston and will return soon to cross a few of the others off our list. Have you been to any of these when visiting Kingston? Which did you like the best? Get in touch and let us know!